Reform, Replace, Restart or Innovate? Scott Walker, Wisconsin’s 45th governor, has been at the center of several high-profile battles almost from the start of his tenure in 2010. He announced his candidacy for president in late July 2015. Walker rose to national prominence after pushing through reforms to Wisconsin’s budget and public sector unions that sparked a massive backlash by organized labor. At one point Democratic state legislators fled the state in an attempt to thwart his proposal, but eventually Walker prevailed. Organized labor and Democrats promptly launched a recall drive against Walker and several Republican legislators, but Walker prevailed in that battle as well. At issue was his plan to limit collective bargaining by state employees, including ending the automatic deduction of union dues from state worker paychecks, requiring public employees to pay towards their health care and retirement benefits; ending mandatory union membership, and requiring annual certification for public employee unions. Walker has also promoted other conservative policy priorities, including deregulation, reforms to lower taxes, and reduced government spending. Before entering the race Walker was consistently ranked in the top tier of candidates, but over the past month has faded somewhat in national polls as well as those in the leadoff states of Iowa and New Hampshire. In part that is due to a crowded field and media attention focused on other candidates, but Walker seems to have slipped from the first tier into the second. He is still likely to have the funding needed to mount a serious campaign for the Republican nomination, and his appeal to all of the key constituencies in the Republican Party remains. Walker is still among the favorites vying for the Republican nomination, although he has ground to make up between now and the first votes cast in February 2016. Scott Walker was born in Colorado Springs, Colo., to a Baptist minister, Rev. Llewellyn Scott Walker, and Patricia Ann (née Fitch), a bookkeeper, on Nov. 2, 1967. His family moved to Delavan, Wis., when he was 10, and he has lived in the state ever since. Walker and his wife, Tonette (née Tarantino), have two sons, Matt and Alex. He graduated from high school, becoming an Eagle Scout during that time. Walker then enrolled in Marquette University in 1986, and began his political career working as a volunteer for Tommy Thompson’s campaign for governor. Walker left Marquette in 1990 without completing a degree, eventually taking a marketing and fundraising position with the American Red Cross. In 1990, Walker made his first bid for public office, running for Milwaukee’s 7th District state assembly seat. After losing that election (with less than a third of the vote), he won a special election in a Republican-leaning district in 1993 and was re-elected to that office four times. As an assemblyman, Walker earned a reputation as a fiscal and social conservative keenly interested in criminal justice matters. He leveraged this reputation to defeat state Sen. Lena Taylor to become Milwaukee County Executive in a 2002 special election in the wake of a pension scandal involving the previous county executive, Tom Ament. Walker made headlines by returning tens of thousands of dollars in salary as he made a push to cut the number of county employees and turn the county deficit into a surplus. In 2006, he made a brief push for the governor’s office, dropping out early due to lackluster fundraising. In 2010, he handily won the Republican nomination and rode the tea party wave to a six-point victory over Democratic incumbent Tom Barrett. As governor, Walker introduced reforms to the collective bargaining process, sparking massive protests and a recall effort aimed at state legislators and the governor himself. Walker survived the recall effort, defeating (again) Tom Barrett by a slightly larger margin. He was re-elected governor in 2014. Walker and his family attend Meadowbrook, a Pentecostal church. Walker has stated his faith is integral to his principled approach to leadership. In terms of cutting the cost of government, Walker notably has a track record of putting his money where his mouth is – on a personal level. As Milwaukee County Executive, he returned $60,000 of his salary per year for several years before reducing that return to a more modest $10,000. This was in keeping with an oft-repeated criticism of outrageous pay for county employees. Meanwhile, Walker’s wife, Tonette, has made substantial renovations to the Governor’s Mansion, including a full kitchen remodel, in contrast to her husband’s austere fiscal leanings. Walker is perhaps most notable, however, for remaining firm in the face of increasingly strident tactics in response to his collective bargaining reform efforts. In response to legislators fleeing the state to avoid a vote on his reforms, Walker evoked a parliamentary tactic and passed the bill without their assistance. He has also endured death threats, massive protests and recall efforts aimed at thwarting his agenda.4 Throughout all of this, Walker has remained steadfast in advancing the agenda he campaigned on. While he has spent a large amount of political capital in his fight to reform state government, he has made savvy choices in preserving key alliances. His collective bargaining reforms exempted popular public safety employee groups, while he has steered subsidies toward Wisconsin’s crucial (and massively influential) dairy industry. 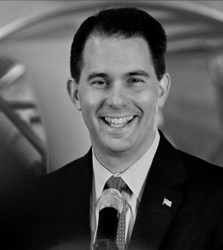 Fellow Republicans have recognized Walker’s status as a conservative leader. He was named chairman of the National Governors Association Health and Human Services Committee, was named to the National Governors Association Executive Committee, and was selected to be chairman of the Midwestern Governors Association. Walker is best known for taking on the public sector union in his home state as governor, but his budgets have been somewhat more mixed in terms of fiscal discipline. His efforts to restrict collective bargaining and increase worker contributions for health and pension plans have saved the state money and will continue to do so. However, he has increased spending even more than the average governor during his tenure. He also established a Commission on Waste, Fraud and Abuse in January 2011, which identified more than $250 million in potential savings to the state. There have been at least two credible reports suggesting Walker may favor less stringent immigration measures than he touts on the campaign trail, including a pathway to citizenship for illegals.41 Walker has denied the reports, however. Critics noted this would put a $500 million investment on hold, disrupting manufacturing. This provision would have been the strictest in the nation. Walker announced his opposition to Obama’s Clean Power Plan, saying it would raise electricity costs for consumers and devastate the economy of Wisconsin and other states.46 He favors giving states much more control over environmental protection and would like to limit the EPA’s role to interstate issues.47 He signed a bill exempting Brown County (home of Green Bay) from certain wetland restrictions and is known within the region for his support of mining, signing a bill streamlining the mining approval process.48 The latter effort is an attempt to fast-track a large iron mine in far northwestern Wisconsin. He also proposed a tax credit for agriculture producers, and has signed into law tax exemptions for fertilizer blending and other agricultural operations, while expanding available financing for farmers. These efforts, praised by farmers, have been criticized by free-market supporters for complicating the tax code and favoring certain industries. Walker helped create the Wisconsin Economic Development Corporation (WECD) in 2011, which loaned taxpayer funds to businesses. As governor, Walker sat on the board, and in 2015 it was revealed the WECD gave $500,000 to the firm of a major donor to Walker. The firm later went bankrupt and it was discovered the firm’s owner had been taken to court for delinquent taxes before receiving the loan.54 A state audit discovered lax accountability at the WECD and that it failed to follow the law and its own policies, and Walker requested that he be removed from the board, which the legislature approved. Walker has said the sequester budget cuts for defense spending should be reversed70 and more recently called for an increase in defense spending. Speaking at the 2013 National Lawyers Convention of the conservative Federalist Society, Walker praised federal appeals court judge Diana Sykes,75 who previously sat on the Wisconsin’s Supreme Court and has been mentioned in the past by many conservatives as a potential U.S. Supreme Court nominee.76 Walker also explained that he looked for appointees to the state’s lower courts who have “an understanding of the proper role of the judiciary”77 (judges are elected in Wisconsin, but the governor makes temporary appointments when a vacancy occurs due to death, resignation, or other cause). As a state legislator in the 1990s, Walker supported disclosure efforts regarding campaign spending, and he suggested more recently he would favor a cap on campaign contributions connected to recall elections if it were paired with a higher threshold for recalls.84 But he generally seems skeptical of campaign finance laws today, calling for the elimination and replacement of the state’s Government Accountability Board,85 which is responsible for enforcing the state’s election laws, and which has been accused of using its authority to stifle conservative political speech and harass Republicans. Walker has been plagued by a series of small scandals throughout his terms as governor. During his gubernatorial campaign, Walker used his campaign email to correspond with his inner circle, often using their private email accounts, which are not subject to public scrutiny. Anecdotal evidence suggests this was commonplace, though it is not clear that there was any intent to escape public accountability. Walker has also been associated with, or implicated in, two different investigations. He was not charged or alleged to have committed a crime in either case. The first investigation involved misconduct by staff in his Milwaukee County Executive office, and Walker encouraged the person who initially uncovered the misconduct to report it to the district attorney’s office. The second investigation, which is ongoing, appears to be a politically motivated and baseless investigation alleging campaign finance violations of independent groups in Wisconsin. Some may raise questions regarding Walker’s decision to drop out of Marquette University his senior year and the occasionally inconsistent explanations he has given regarding the circumstances. But contrary to allegations by the Wisconsin Democratic Party, there is no evidence he left due to misconduct of any sort, and substantial evidence indicates he left in good standing. While Walker is well-versed in domestic policy, he has until recently had very little to say regarding national security and foreign policy, and some are likely to question his knowledge of international affairs and readiness to step into the commander-in-chief role.